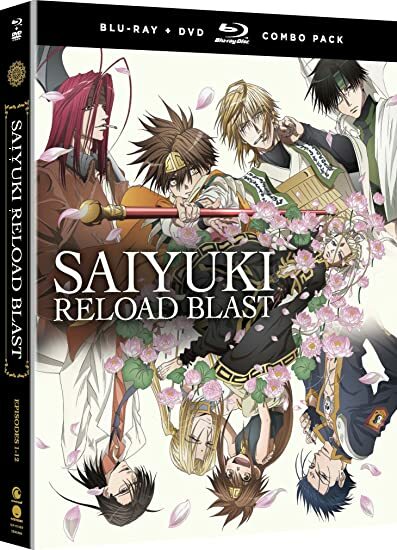 Saiyuki Reload Blast - BUY THIS BLU-RAY! The journey to the west continues. The boys of the Sanzo party are back and looking better than ever—albeit a bit hungry. When they’re not fighting off demons or searching for a good meal—or smokes!—they’re making their way to take on the Ox Demon King. But the weight of the past is finally catching up with them, and getting to India may be the least of their worries. The truth behind their lives in Heaven comes to light. Then, a mysterious boy appears, and with him comes destruction. Will Goku remember the boy he once called a friend, or will it all end in bloodshed? And what of the prophecy that speaks of their demise? It all spells nothing but trouble, but if there’s one thing this bickering band of misfits can do, it’s survive. THEN SEND IN A COMMENT ABOUT YOUR FAVORITE FUNIMATION TITLE (you may click on artwork above for a refresher) PLUS YOUR NAME AND ADDRESS TO contests@efilmcritic.com or WeLoveHBS@aol.com. (Just one e-mail please.) Put [b]"SAIYUKI! RELOAD!" in the subject line and cross your fingers. We will draw names and one of the prizes could be yours. Only 1 entry per household.